Concepts related to the brain, mind and consciousness have intrigued both philosophers and scientists since time immemorial. Although the former have speculated on the nature of the mind and put forward many theories of consciousness, the brain as an object of scientific enquiry, and how it relates to functions ordinarily subsumed under the mind, is a relatively recent phenomenon. The emerging body of evidence that the cognitive neurosciences (neurobiology and neurophysiology) and cybernetics are producing cannot but impact philosophers' understanding of mind and consciousness and compel them to revise many of their long-held theories and convictions. At the same time, many speculative insights of the philosophers regarding mind and consciousness can offer great areas for reflection and experimentation to the neuroscientists. Philosophy of mind is an active, intensely evolving body of knowledge, as much as are the neurosciences, and one cannot afford to be oblivious of the other. This 2011 Theme Mens Sana Monograph titled 'Brain, Mind and Consciousness: An Interdisciplinary International Perspective' is an attempt to present the salient reflections/findings of scientists and philosophers on the interconnections between these concepts and evolve an ongoing dialogue between them so that a robust body of knowledge serves as a foundation for further enquiry in this intriguing, and vastly unexplored, field. Such a dialogue between the different stakeholders is necessary to evolve a comprehensive corpus of interdisciplinary thought that complements the scientists' empirical, experimental findings with the philosophers' reflections, analyses and speculative insights, and vice versa. This is all the more necessary now, as barriers to knowledge sharing need to be replaced by bridges of knowledge diffusion across geographical, cultural, and more importantly, ideological and even disciplinary boundaries. This will bring about much needed integration of thought and understanding in a world which talks of a global village and world unity but is ripped apart by political ideologies and national interests. A topic such as this, which has important inputs from diverse sources, cutting across geographical boundaries, historical epochs and disciplinary bindings, is eminently suited to become one means to evolve such a global outlook. Hopefully, that is, if it is not asking for too much. This is with regard to the some salient contributions of western philosophers. There will be occasion to review some of their work in this monograph, and the ones to follow. These, and many others, deserve a close look, which also should be our endeavour in this, and subsequent, monographs. In the last few decades, there is a vast body of work by different neuroscientists on the neurotransmitters, especially the biogenic amines, aminoacids, neuropeptides, etc., as well as significant advances in neuroimaging studies. There are so many other areas of activity, and the neurosciences are teeming with research work. The emergence of the neurosciences as a distinctive discipline, with inputs from both scientists and philosophers, is an exciting development, which holds much promise and must be welcomed with great joy. All these shall be reviewed in this, and future, work in this series. Although scientists and philosophers are busy forwarding their respective approaches to brain, mind and consciousness, and with ample justification, precious little is being done to integrate the vast body of knowledge that already exists about these concepts in these independently progressing branches of philosophical thought and scientific experimentation. The neurosciences are a brave attempt to bridge the gap, but most mainstream philosophers and scientists, much to the dismay of those who wish for greater contact, remain wary of each other. This, of course, is also because both sides carry enormous baggages of past disconnected bodies of work, and present lack of understanding of each other's thrusts and motivations. This monograph is a step to help the process of such integration and help develop a comprehensive picture. A huge mass of work already exists on the mind. We need to present and review classical and modern concepts and theories about mind and consciousness, including the mind-body or body-mind problem; the idealist and materialist views about mind; the identity, the computational and double aspect theories of mind; monistic and dualistic theories of mind; as also interactionism, epiphenomenalism, structuralism, reductionism, materialism, occasionalism, neutral monism, functionalism, psychophysical parallelism and so many other 'isms.' No new theorising can afford to ignore this vast corpus of work that has already been bequeathed us by the great theorists of yester years. The philosophy of mind is intimately connected with the philosophy of action. Therefore, concepts like free will, motive, intentions, cognition, volition, feelings and also ethical issues related to these, are of abiding interest, and therefore of concern for this, and subsequent, monographs in this series. Questions related to cognition like perception, sensation, insight, intuition, judgement, as also thought, analysis, and the notions of doubt, inference, reasoning, logical thinking, and how these are connected to our understanding of the mind and its connectedness with evidences from research in the neurosciences, will also be of interest in this connection. The problem of consciousness needs to be connected with that of the mind, but not only our philosophical understanding of the mind, which of course is very important, but also the emerging evidence from brain research, especially neuroimaging. Moreover, the various metaphysical positions like the dualist and physicalist theories, and the specific ones like higher-order, representational, cognitive, neural and quantum theories, need to be put in perspective to understand where we stand in our grasp of this complex topic. Also worthy of detailed interdisciplinary analysis are concepts like Qualia, Introspection, Self-knowledge, Creature and State Consciousness, and the mechanism of mental operations [Table 3]. Work in scientific psychology, especially Behaviourism (Watson, 1924; Skinner, 1953), Gestalt psychology (Kφhler, 1929; Kφffka, 1935) and, more recently, cognitive psychology with emphasis on modelling internal mental processes and information processing (Neisser, 1965; Gardiner, 1985) also need critical appraisal. A major resurgence of scientific and philosophical research into the nature and basis of consciousness in the 1980s and 1990s, with the works of Baars, 1988; Dennett, 1991; Penrose 1989, 1994; Crick 1994; Lycan 1987, 1996; Chalmers 1996, need to be extensively critiqued as part of this, and subsequent, monographs. All these are exciting developments that need to be noted here and their role and influence on present and future developments in the field closely studied, and furthered. There is a vast, and largely unexplored, mass of writings related to the concept of mind in Indian thought (for an overview, see, for example, Chennakesavan, 1991), which needs a careful and detailed exposition and evaluation. By unexplored, we mean at the international level; at the Indian level, a lot of work is being done, which, however, has still to receive international attention. That is probably because most of it is at the local level, in the local idiom, and largely explicative, often idolatry. The way forward is to yield way to robust evidential and sharply critical enquiry of even the most hallowed concepts in the tradition so as to establish their contemporary relevance. The greatest of masters, the greatest of treatises and the most revered of concepts must be subject to such a scrutiny. First of all, let us see what these are. Concepts related to mind and consciousness have occupied Indian thinkers for centuries. Some (like the ones in [Table 5]) need to be comprehensively critiqued, and this shall be the task for the present and future issues of MSM. [Table 5] is a representative sample. Just a perusal of the topics will make clear the amount of work available, and the quantum of work now to be done over it, to make it a corpus of contemporary international relevance. As noted earlier, for internationality, critical and evidential enquiry, not necessarily only reverential and explicatory, will need to be seriously forwarded by those who have the interest of Indian thought at heart. We appeal to all scholars of Indian thought to tackle these, and related topics, in future issues of the Mens Sana Monographs; but always remembering that they present their ideas in a modern idiom (that is, forwarding the critical and evidential approach, we talked of in the earlier paragraph, which hopefully can also be comprehensive and eclectic). For this, it is first of all necessary that contemporary scholars/researchers of Indian thought agree on definitions of concepts/terms, and also agree to a Standard English translation of Sanskrit terms, as also of original and secondary treatises. This is a huge intellectual task, for which a group of recognised authorities in the respective darχanas will have to get together and evolve a consensus on the definition of terms, on the authenticity of their translation, and on the authentic translation of the important treatises of their respective darχanas. A ten-year period must be devoted exclusively to this enterprise, if not more. This is one task the Indian Council of Philosophical Research, and such other Bodies, which have the interests of the Indian Philosophies at heart, need to further. For we need not just proliferation of Indian thought, but also its orderly progression. Further explication and critical evaluation will be greatly facilitated by this initial ground-work. The brain is a complex organ, the structural correlate of the mind, centre and head of the central nervous and neuroendocrine systems, whose various areas are yielding fascinating, though rather tardy, information to science and biology. Areas like the cerebrum, which controls higher functions like thought, language, moral and social conduct, creativity, spirituality etc, need as much study as the limbic system connected with emotions and sexuality; and the neuroendocrine system which controls an organism's response to stress, emotions, thoughts and feelings. As also the various pathological conditions that result from toxic, metabolic, infectious, degenerative and congenital/traumatic conditions of brain pathology; not to forget the great number of neuropsychiatric conditions with hitherto ill-defined aetiology like schizophrenia, the affective disorders, epilepsies, dementias and the various neuroses that are great areas of interest and activity in clinical and research psychiatry/neurology. The emerging vast body of evidential findings from the various neurosciences, including classical psychiatry/neurology, neurobiology, neuropsychology and neurophysiology, needs a thorough presentation and a close look if present and future philosophic theorising has to be grounded on solid foundations. The interdisciplinary field of cognitive neuroscience, which connects the sciences of the brain [neurosciences] with the sciences of the mind [cognitive science], needs a special and careful look. Neuroimaging and ionic/molecular processes studies are yielding fascinating information of brain function that philosophers of mind can ill afford to ignore. The papers of neuroscientists and a close look at their findings will be a special feature of this monograph, and the ones to follow. Also worth a close look is the need to dispel confusion about the concepts 'brain' and 'mind,' and their relationship. Centuries of writings and opinions have only served to blur margins and make vagueness the hallmark of the relation between these two concepts. In general, historically, the concept 'mind' has received greater attention than the entity 'brain,' and that has not helped clear the confusion. The reason most probably was that although brain activity may have fascinated mankind down the ages, for want of precise instruments to measure it, reflection in the form of enquiries into a functional entity called 'mind' gained precedence over evidential enquiry into a structural entity called the 'brain.' Hence, the concept 'mind' gained greater prominence over the entity 'brain.' This is in urgent need of repair, of course without overbalancing to consider structure to be all, and neglecting function, which is what really is of importance. In no theories of the philosophy of mind of earlier times, both in the east and the west, was there any significant attention given to the entity called brain. Nor have modern philosophical theories done much to repair the damage. That we have continued with this neglect is obvious from the fact that there is no entry 'brain' in any dictionary (Flew, 1983; Lacey, 1986; Frolov, 1984) of philosophy, or any encyclopaedia for that matter, either print (e.g. Edwards, 1972) or online (e.g. Stanford, 2010; Internet Encyclopedia of Philosophy, 2010). We had access to these; others, or more recent editions, may have hopefully set the damage right. This is in urgent need for repair. How can any discipline theorise effectively about the mind without understanding what is the brain? * Mercifully, a dictionary of psychiatry did not miss having an entry on mind, while of course having one on the brain [Campbell, 2004; brain on p94; mind on p408], probably because the discipline can ill afford to neglect either. In sum, then, neglect of the entity brain by philosophers of the past is in urgent need of repair by the philosophers of today. Of course those doing interdisciplinary work have tried to repair the damage, but there have to be more shoulders to the wheel. Avoid neglect of the entity brain by philosophers of mind. A significant initiative in this direction would be to clarify the connection between 'brain' and 'mind,' and try and evolve a comprehensive definition of consciousness. These shall be our concern in the next two sections [II.1, II.3]. Also intimately connected with these is the mechanism of mental operations, which we shall detail in the section to follow them [II.4]. 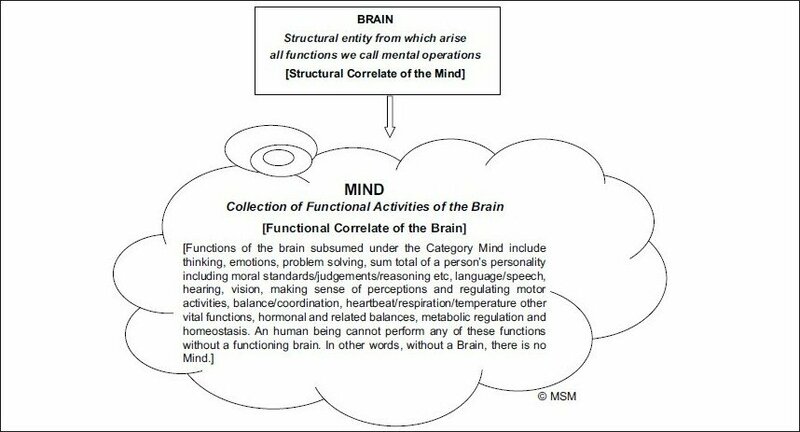 In this connection, we put forward a formulation [Figure 1] and [Figure 2],[Table 6] and [Table 7] that delineates the relation between 'brain' and 'mind' [Figure 1] and [Figure 2], [Table 6] and between 'brain,' 'mind' and 'consciousness' [Table 7], to accept, modify or criticise, and to tear apart, if you can. 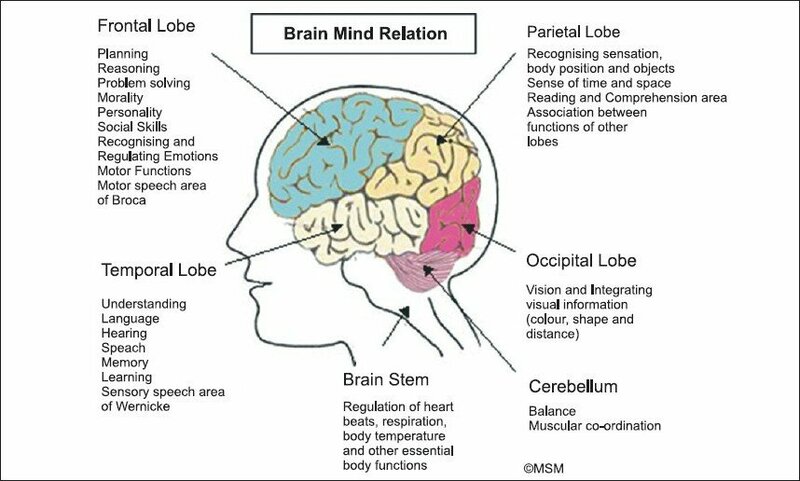 Figure 1: The structure Brain carries out functions like thinking, emotions, problem solving, sum total of a person's personality including moral standards/judgements/reasoning etc, language/speech, hearing, vision, making sense of perceptions and regulating motor activities, balance/coordination, heartbeat/respiration/other vital functions, hormonal and related balances. All these functions can be subsumed under a broad category of functions called Mind. Brain is the structure, Mind a collection of its functions. Brain and Mind, though connected concepts, are not synonyms. They should not be used interchangeably. Figure 2: The structural entity from which all mental operations arise is the brain. The collection of these functional activities of the brain is called the Mind. Brain is the structural correlate of the Mind. Mind is the functional correlate of the Brain. Brain is a structural entity, Mind is not a structural entity: it is a convenient label for a collection of Brain's activity. One should avoid reifying the Mind. The further ramifications of the formulation in [Table 6] may also interest us here. We must clarify the existence of, and connection between, brain, mind and consciousness [Table 7]. 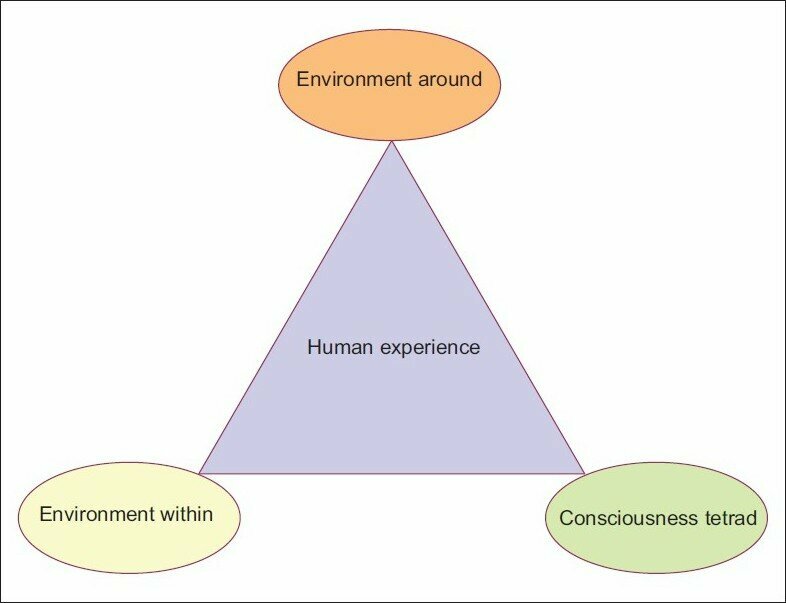 Figure 3: A living human being's life experiences are a dynamic interaction between the environment around, the environment within, and the different forms of consciousness [Consciousness Tetrad, see Figures 4-5] that help him make sense of both these environments. What is applicable to human beings is applicable, to a lesser extent, to other living beings too, taking for granted that they also can experience, and humans are the most evolved of living beings, as yet. From the environment around-nature [living, non-living], people and their products, and our perceptions and interactions with them. From the environment within-perceptions/sensations/cognitions of internal bodily processes-body includes the rest of the body and also the brain. A consciousness that makes sense/nonsense of these two environments. It is consciousness, then, that can guide or misguide us in our experiences. Hence, it becomes essential to study its structure and function all the more carefully. The most contentious issue in the study of consciousness is to define it. But before we think of defining, we must find out how differently we can view consciousness. At least the following four important considerations must be given serious thought [Table 8], and [Figure 4] and [Figure 5]: the Tetrad of Default Consciousness, Aware Consciousness, Operational Consciousness and Exalted Consciousness. 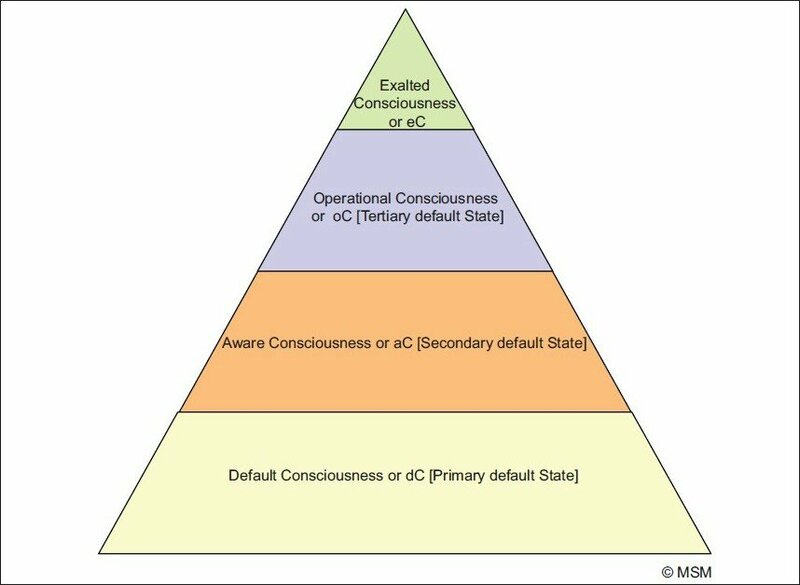 Figure 4: All forms of Consciousness, Aware, Operational and Exalted, rest on the primary default state, dC, which is their base. Meaning without it, the other states cannot arise. From this base arises the aware state, aC, in which we are awake, drowsy, in sleep, or in an altered state eg hallucinating, delirious etc. This is the secondary default base, meaning States 3 and 4 rest on it and cannot result without it. This aware state is the base for the operational state, oC, wherein arise thought, emotion, morality, aesthetics, creativity, motor and sensory operations etc. This is the tertiary default state, meaning State 4 rests on it and cannot result without it. This operational state, used with discretion, results in the exalted state, eC, wherein one can commune with, meditate upon, the divine, Self, God, Brahman etc; it also results in some special forms of creativity (meditative or spiritual creativity). Figure 5: It is default Consciousness, dC, the first ground state, which makes a human being living. Having life, arise the awareness states, aC, which become the 2nd ground state for brain activities to start. Upon this state operate our thoughts, feelings, actions and sensations etc., oC. From this state, under proper conditions e.g. contemplation, meditation, introspection, prayer etc, or a combination of these [all functions of oC], arises the exalted state, eC. The eC tries to cut off all oC and reach the dC state, devoid of all thought, sensation and feelings etc [Arrow 1]. Both aC and oC try to impinge on eC [Arrows 2,3], and eC tries to also regulate and alter oC and aC [Arrows 4,5]. eC, oC, and aC, all in diverse ways, operate on the Human Being [Arrows, 6,7,8]. This is the dynamic manner in which a living human being is regulated by his various forms of Consciousness, and in turn regulates it. 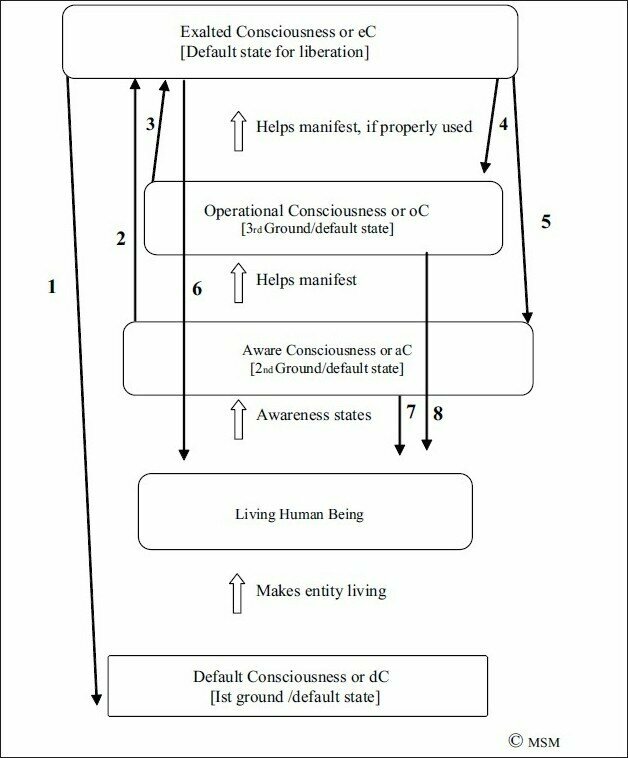 Although stakeholders appear different [Table 8], all these forms of consciousness are actually inter-related and interdependent. The picture, however, is so obfuscated that often the only thing common between scientists and philosophers is use of the word 'consciousness'--so different are their interpretations of the term. Their diverse understandings have added as much colour as confusion to this hitherto ephemeral concept. It is time it is retrieved from the realms of speculation and rhetoric to the world of empirical and evidence-based study. Hence, the attempt below. First and foremost, it is necessary to understand the four different forms of consciousness [Table 8] and understand the rough structure of this tetrad [Figure 4] and [Figure 5]. This will help understand the dynamics of their relationship with each other and the living human in whom they interact [Figure 3]. Thus, it will develop a comprehensive picture of the living human being's triad of influences-a being in dynamic interaction with his internal/external environment, and the CT that makes it all possible [Figure 3]. 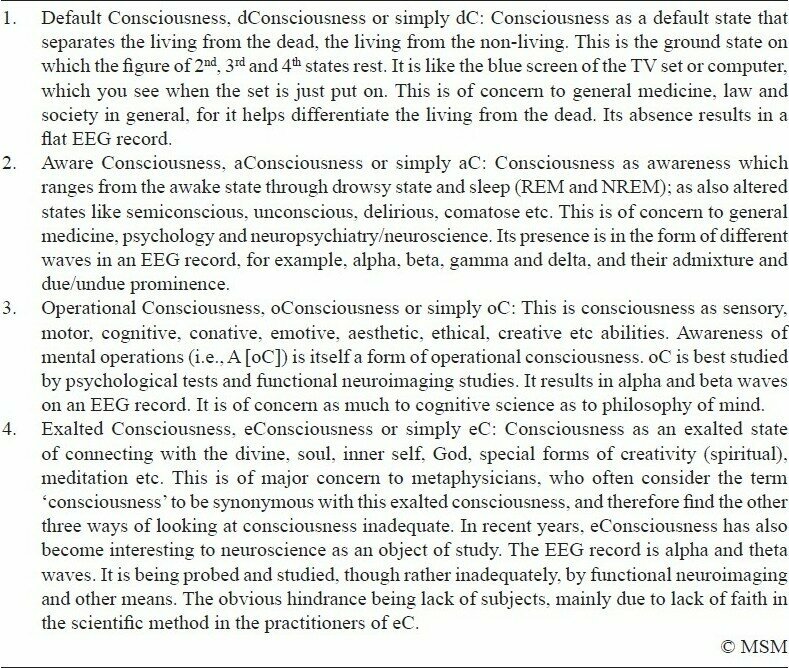 Default consciousness, dConsciousness or simply dC; Aware consciousness, aConsciousness or simply aC; Operational Consciousness, oConsciousness, or simply oC; and Exalted Consciousness, eConsciousness, or simply eC are the four forms of the CT that must occupy our attention [Table 8], [Figure 4] and [Figure 5]. Now that we have an understanding of consciousness, minus the clutter, the best next move to make in this direction, even if to the consternation of many, would be to try and evolve a consensus on a definition of consciousness, keeping in mind the varied interpretations of the stakeholders involved. As a step in that direction, based on the discussion we have had till now, we may present here a working definition of consciousness, to be worked over and modified, as necessary. A default consciousness, which is a primary default state differentiating the living from the dead and the non-living. Primary default state means without this, no other consciousness state can result. Consciousness also consists of a state of aware consciousness which includes the different stages from awake to sleep, including drowsy, dreamy, non-dreamy etc, as also altered states like delirious, comatose, illusionary, hallucinating etc. This is the 2 nd or secondary default state on which rest states 3 and 4. Secondary default state means without this, states 3 and 4 cannot result. Consciousness is also a state of operational consciousness wherein all observable/unobservable brain operations like cognition, perception, emotion, conation etc result. Self consciousness, or self-identity, is itself a form of cognition, and therefore a part of operational consciousness. This is the 3 rd or tertiary default state, which means without this state, state 4 cannot result. Consciousness is, finally, also a state of exalted consciousness wherein the brain establishes a communion with the 'inner self,' the divine, God, soul etc. It does this through some activities of operational consciousness which are furthered and others suppressed/ignored, e.g., cognitive processes like meditation, introspection, focussed concentration, or a mixture of these and related techniques are furthered, while sensory perceptions and emotions etc are ignored or suppressed. This consciousness is the final default state needed for achieving liberation, mokωa etc. The Mens Sana Monographs would be most pleased to help evolve a comprehensive definition of consciousness in its future issues, taking into consideration the consensus of all stake-holders involved. The above formulation could, hopefully, serve as a starting point. II. 4. The lattice of mental operations: Or, how do mental operations result? One other contentious issue, which must concern us here, is detailing the relationship between observable mental operations and related subtle brain physical activity. In other words, understanding how do mental operations result. Now that we understand that the brain gives rise to the mind, we will also understand that every mental operation or phenomenon [M 1 ] is the result of physical changes in the brain [P 1 ], which are due to intraneuronal or interneuronal activity, which latter includes neurotransmission and neurotransmitter activity at the synapses. For example, when one thinks of a mental operation, M 1, there is a physical change in the brain that brings this about, P 1 [Figure 6]. Figure 7: An earlier mental operation M, itself caused by an earlier physical brain activity [P], causes the mental operation M1. Figure 8: Same as Figure 7. An earlier mental operation M, itself caused by an earlier physical brain activity [P], causes the mental operation M1. But, we already said that P 1 → M 1 . Thus, we can say, combining [Figure 6],[Figure 7] and [Figure 8], that P causes M, which causes M 1 , which itself is caused by P 1 [Figure 9]. In our earlier example, one decides to think about consciousness [M] which brings about a thought about consciousness [M 1 ], but both these are brought about by their respective antecedent physical changes in brain neurochemistry [P → M, and P 1 → M 1 ]. Figure 9: An earlier physical brain activity, P, causes an earlier mental activity M, which causes the present mental activity M1 which itself is caused by a physical brain activity P1. But we must also note that while M → M 1 , P→ P 1 . So, the better way of looking at the figure is as in [Figure 10]. 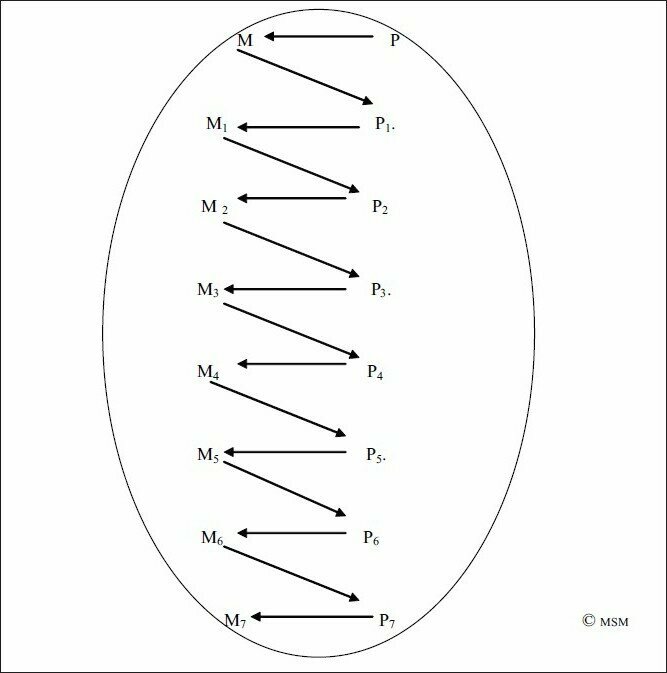 Which means that to any mental event M 1 , there is a preceding physical activity P 1 , and a preceding mental activity M, which itself is preceded by a physical activity P.
What is obvious at the gross level is this progression from M → M 1 . This is of interest to philosophers and scientists who work on observable phenomena. What is seen at the subtle level is P → P 1 , which is studied at the neuronal level by neurobiology and neuroimaging [Legend, [Figure 10]]. Figure 10: To any mental event M1, there is a preceding brain physical activity P1, and a preceding mental activity M, which itself is preceded by a brain physical activity P. M ?#168; M1 is observable mental phenomena, studied by psychologists, neuropsychiatrists, other neuroscientists and philosophers. P ?#168; P1 is causative subtle physical brain activity, studied by neurobiologists and neuroimaging studies. It is necessary to combine both to get a comprehensive picture. But we have still not got the correct picture. 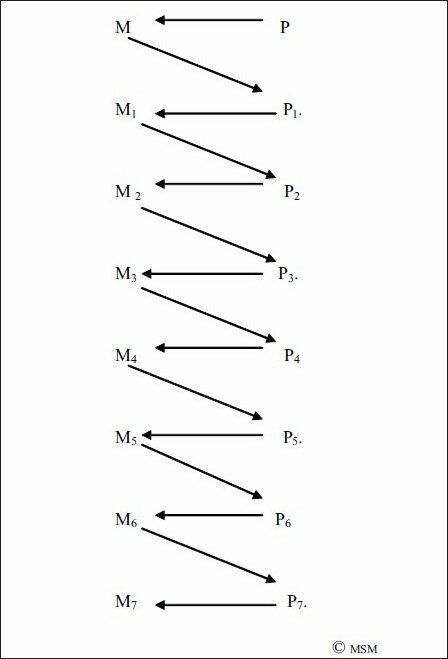 Though we say that a mental operation we observe [M 1 ] is the result of an earlier mental operation [M], and the physical operation [P 1 ] is the result of an earlier physical operation [P], the relation does not move in parallel; it is more complex [Figure 11]. The initiator of the physical changes in [P 1 ] is itself an earlier mental operation [M] which precedes it, which is in the form of a thought, emotion or activity which causes it, which itself is caused due to a physical activity in the brain [P]. That is, P → M → P 1 → M 1 Which means, although what we may feel mental operations are like in [Figure 10], they are as in [Figure 11]. Pictorially, an inverted Z. Thus results the progression of mental operations from observed mental operation M 1 to observed mental operation M 7 [Figure 12] . And, that is how mental operations in one chain/series continue. But mental operations do not progress in a linear fashion alone. They are further preceded and succeeded by further such linear progressions. If we consider one such progression pictorially as a spiral-oval [Figure 13], it is connected to and influenced by many such spiral-ovals, which may go on simultaneously [Figure 14]. 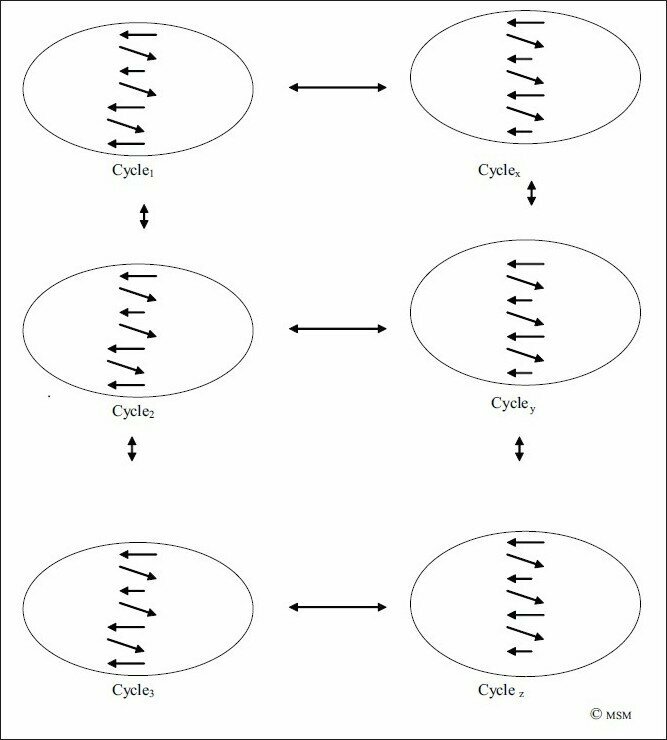 Figure 14: A spiral-oval of thought [Cycle 2] is in dynamic interactions with other spiral-ovals of preceding [C1], succeeding [C3] and parallel/connected thought spiral-ovals [CX, CY] etc, which themselves are in dynamic interaction with each other. The more complex is the thought, the greater the cross-linking of such spiral-ovals. If we call the above as Cycle 2, it is preceded by C 1 and succeeded by many other cycles C 3 , C 4 , C 5 , …… [Figure 14]. It is further influenced by, and in turn influences, many other thought spirals running in parallel, C x , C y , C z…… For example, while one thinks of consciousness, one may also need to think of answering the ringing phone, and think about what to do about the advance tax to be paid, and also the airline ticket for the upcoming conference, and the car which needs servicing. All these thoughts set up their own cycles, but which interact with the predominant thought at a certain point in time. 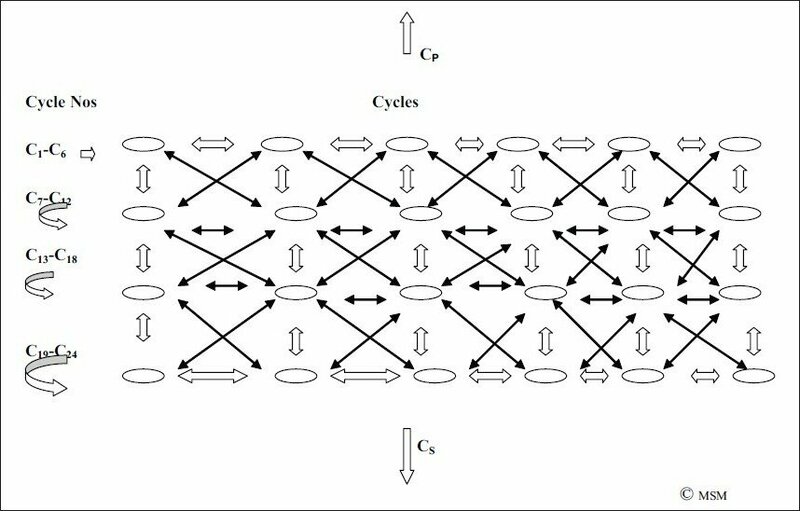 Thus, a huge lattice of thought is formed [Figure 15], a vast matrix of interconnecting inverted Z thought spiral-ovals [what we have called Cycles], which is like a giant web of cross-linked thoughts, thoughts which are also linked with feelings/perceptions/activities which form similar spirals themselves, interacting with-enhancing/modifying/subduing/restricting etc-the expression of a certain thought at a certain point in time. This intricate lattice [Figure 15] only matches the intricate web of the neuronal network that gives rise to it. Figure 15: The lattice of mental operations [C1-C24] in dynamic interaction with each other. The greater the complexity, the greater is the interaction. The complex pattern of thought parallels the complex matrix of neuronal interconnections. Both are criss-crossing and inter-related. There are cycles preceding [CP] and succeeding [CS] these. As is obvious in [Figure 15], the first row of mental operations, C 1 -C 6 , are dynamically inter-related. They are in two-way correspondence. If C 1 affects C 2 , C 2 can equally affect C 1 . Similarly, with C 2 and C 3 , and so on in the first row. But C 1 is not affected in a linear fashion alone. C 1 is also affected by C 7 below, and also by C 8 in criss-cross. It can also be affected by C 24 from the other dynamic end. This two-way interconnected correspondence between cycles of thought makes for its complexity. The more complex and inscrutable the thought, the greater are these interconnections. In orderly progression, there are relevant interconnections. In disorganised thought states, bizarre dreams, delirious states, delusions, irrelevant [or seemingly relevant] thought cycles impinge on the mental operation being considered, and give rise to its weirdness and inscrutability. As and when these connections are disentangled or understood by psychotherapy, meditation, introspection, self-knowledge etc, these interconnections are understood, disentangling can occur, and the mental operation can be retrieved from its disorganised and inscrutable state. That is what Freud, for example, tried to do when seemingly weird, or innocuous but disturbing, ideas in the conscious were analysed and the 'unconscious' mechanisms that made them weird, or innocuous but disturbing, were disentangled from their disturbing impingings, and thus allowed to manifest in their clear state, free from the envelope of past thoughts and painful emotive underpinnings. One such lattice presented here, as C 1 to C 24 , is preceded and succeeded by many such thought lattices, which include the lattices of other mental operations, including emotions, perceptions, memories, motivations, which have their own lattices, but which are in dynamic interaction with each other, and the present and such other thought lattices. This, a vast network-lattice of mental operations results, closely parallel to the vast lattice of brain neuronal network on which it is based and from which it springs. This lattice of mental operations is a product of the structural entity brain, which goes to form a functional matrix called mind, results in what is human experience and is possible because of consciousness, which itself is a product of brain operations and one of the functions subsumed under the entity mind. Thus, brain, mind, consciousness and human experience are interlinked. The attempt in this monograph, and in forthcoming ones, is to bring together scholars and intellectuals from diverse streams and evolve a body of knowledge that will further our quest in this intriguing, but still largely inscrutable, area of philosophical/scientific enquiry. Why has this not occurred till now? It is not that it has not, but the attempts have to be furthered with greater vigour. What probably hinders more work in the field is a communication gap, which is the result of a psychological blind spot. Philosophers intimately connected with study of mind and consciousness may know little of brain research. Scientists intimately connected with study of structure and function of the brain may know little about the various theories of mind and consciousness that have engaged philosophers down the centuries, and even actively engages them today. The reasons for this are (1) Both use the same concepts, e.g. 'mind,' 'consciousness' etc, but speak very different languages technically; and (2) Both make feeble, if any, attempts to make the other understand, or themselves understand what the other has to say-either because of sheer intellectual laziness, or a fear they may have to revise/forsake long-held and life-long commitments to concepts and theories and experience a discomforting intellectual dιjΰ vu. But we must persist, nevertheless, having faith in the resilience of individuals and the worthiness of the enterprise. The attempt to bring the two bodies of researchers together to evolve a corpus of knowledge that will be mutually beneficial and, hopefully, more than the sum of its parts, needs to be furthered and cannot be forsaken, whatever the obstacles. The possibility of opening up new areas of research and throwing up new questions for future research, as well as helping contemporary researchers reorient/rethink their present positions/convictions as a result of such interdisciplinary approach is an exciting possibility. Critiques and reviews of established positions and theories are welcome, but original contributions are equally to be encouraged. A close look at Indian concepts of mind and consciousness is equally important. We expect this issue and subsequent work in this series to do both. Before this can be done, and even while doing them, there are some strongly felt but unmouthed convictions that need to be understood as biases/prejudices and disposed of. What, then, need be the attempt? The attempt must be to bring the two together, which will hopefully dispel these notions and prejudices, and promote much needed respect for each other, and a dialogue and serious study of each others' work. This will add incrementally to the body of knowledge in the respective fields without they losing their individual thrust. It will also result in a surge in interdisciplinary studies, which can become personal eye openers for individual researchers. A parting thought: Why at all should philosophers study the brain? and scientists study philosophy of mind? Scientists have managed to study the structure of the brain in the most intricate detail without having even a passing acquaintance with the philosophy of mind. Therefore, would it not be better if both continue to do what they do best? And those who are interested in integrating what they do, can do the integration, and satisfy their curiosity? Why at all try to involve everyone in the enterprise? Yes, indeed, both should try to do what they do best, and no one prevents them from so doing. That is not the purpose of integrated effort at all. The purpose is to do something when we now realise that their best is not adequate enough; that though they work on similar topics, a clear picture has evaded both, probably because their efforts have been piece-meal and partial. The philosopher is deprived of the experimental method; the scientist is deprived of the methods of reflection. It is like the lame who cannot walk, and the blind who cannot see. But, if both get together, and the lame got on to the shoulders of the blind, the journey could be successfully completed. Of course provided we accept who is lame and who blind. Philosophy can supply the vision, science must supply the limbs. The situation could be remedied only if they synergised efforts, realising their strengths and the stakes for which they play. There is also another reason. Both philosophers and scientists have a huge mass of theories and data on these topics, and none is ready to, or need, relinquish efforts. This means that no one can any longer afford to neglect the output of the other, for both are equal stakeholders in the enterprise. Hence, any philosopher who tries to get a comprehensive view of, or tries to give a comprehensive theory of, mind and consciousness today simply cannot afford to neglect the mass of knowledge available from science about these categories from brain research. A similar situation obtains for scientists and neuroscientists about philosophy of mind. Any scientist who tries to get a comprehensive view of, or attempts to give a comprehensive theory of, mind and consciousness cannot afford to neglect the huge mass of reflections on the topic down the centuries by philosophers of mind, which continues even today. The neuroscientist, and scientist-philosopher, is in the best position to remedy matters, provided he does not have an aversion for, or harbour deep-rooted prejudices against, either empirical science or reflective philosophy, and is ready to sharpen his skills to do both. Easier said than done. The task that beckons is to evolve such a comprehensive knowledge, and theory, as will settle, once and for all, all contentious issues about this topic that has intrigued both philosophers and scientists down the centuries. The stakes are large, and hence the effort required has to be equally large to match the task. There is a need to carefully study the work of diverse appearing branches like philosophy, cognitive neurosciences and biology to get a comprehensive grasp over topics like mind, brain and consciousness. It is also necessary to define the brain-mind relationship, and to understand how human experience and mental operations result. And also develop a comprehensive definition of consciousness, keeping in mind the views of the different stakeholders involved. Also needed is a careful understanding of the Indian concept of mind and consciousness. Finally, it is necessary to forward interdisciplinary work between scientists and philosophers in this field, of course with the caveat that (1) it is without they losing their individual thrusts; (2) without stunting the special contributions of their respective disciplines; and (3) also without stopping their own special contributions in their respective disciplines. This is our original, unpublished, work, not under consideration for publication elsewhere. Is it possible to involve all stakeholders to evolve a comprehensive definition of consciousness? Is it at all necessary? Integration of approaches is fine in principle, but will it not give rise to decrease in thrust of the respective fields? Why is it at all necessary to critically evaluate Indian thought when its explication itself is being neglected today? Why not make a sincere and strong attempt to understand what the ancient masters did? Why go for half-baked and incomplete theories, which Westerners keep producing, and revising, when the great Indian masters of yore have already made a complete and systematic delineation? Will philosophers and scientists ever revise their deep-seated opinions and prejudices against each others' work and approaches? Why not allow them to work based on their strengths and basic assumptions? Mind and brain need to be understood in a proper perspective is fine as a thought. But, the concept mind has already been developed and written about for centuries by philosophers both of the east and the west. How can we just discard all their work by formulating a relationship that negates the entity status to the mind? Why can scientists not let the philosophers carry on with their concept of mind and consciousness, and they carry on with their research on the brain? Why should they try to hijack the agenda and usurp all the space in this field by negating the contributions of mind-body and other philosophical theories to the field? The Consciousness Tetrad needs further delineation. Does it seek to replace the different formulations about consciousness in existence today? Consciousness as a metaphysical concept does not lend itself to scientific enquiry. Why not, then, let it be so? Why should science try to step into philosophy's domain? Why not live and let live? Allow each to grow in its own way, with their own assumptions, and within its own domain and sphere of influence? The lattice of mental operations must provide for the exact relationship between physical brain operations and consequent brain functions. How do we accept what come first? 2. Baars B., (1988 ), A Cognitive Theory of Consciousness. Cambridge: Cambridge University Press. 3. Berkeley G., (1710/1957), Treatise Concerning the Principles of Human Knowledge. (C. M. Turbine, Ed.). New York, NY: Bobs-Merrill. 4. Brentano F., (1874/1924), Psychologie vom empirischen Standpunkt. Leipzig: Duncker und Humblot, 1874 (2 nd enl. ed. with notes by O. Kraus, Leipzig, Meiner, 1924); Eng. tr. : Psychology from Empirical Standpoint, trans. by A. C. D. B. Terell and L. McAllister. London: Routledge (2 nd ed. by P. Simons, 1995). 6. Campbell R.J., (2004), Campbell′s Psychiatric Dictionary. New York: OUP. 7. Carnap R., Morris C., Neurath O., (eds. ), (1938), International Encyclopedia of Unified Science. Vols. 1 and 2 . Foundations of the Unity of Science. Chicago: University of Chicago Press. 8. Chalmers D., (1996), The Conscious Mind. Oxford: Oxford University Press. 9. 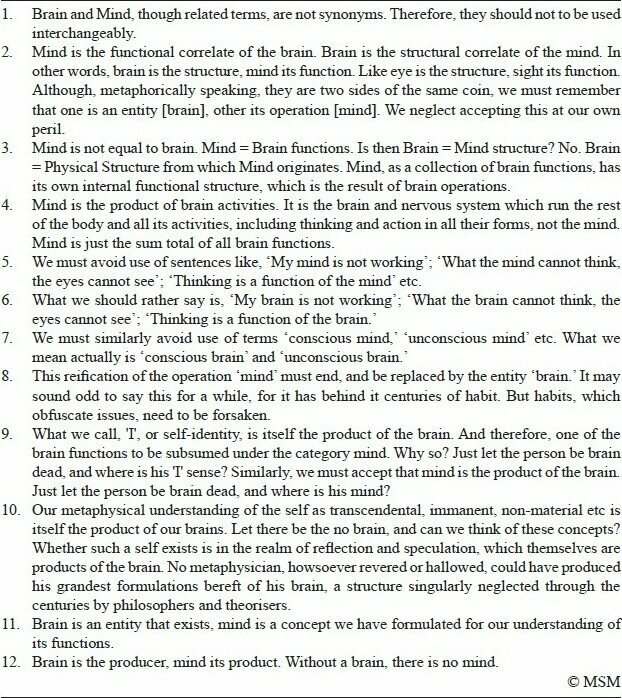 Chennakesavan S., (1991), Concept of mind in Indian Philosophy. NewDelhi: Motilal Banarsidass. 10. Churchland P.M., (1985), Reduction, qualia, and direct introspection of brain states, Journal of Philosophy, 82 , p8-28. 11. Clifford W.K., (1879), Lectures and Essays. Volumes I and II (edited by Leslie Stephen and Frederick Pollock, with an introduction by Pollock). London. 12. Crick F.H., (1994), The Astonishing Hypothesis: The Scientific Search for the Soul. New York: Scribners. 13. Dennett D.C., (1991), Consciousness Explained. Boston: Little, Brown and Company. 14. Descartes R., (1644/1911), The Principles of Philosophy. Translated by E. Haldane and G. Ross. Cambridge: Cambridge University Press. 15. Descartes R., (1996), Meditations on First Philosophy. Translated by John Cottingham Cambridge: Cambridge University Press. 16. Edwards P., (1972), The Encyclopedia of Philosophy. New York: Macmillan; London: Collier Macmillan. 17. Feigl H., (1958), The "Mental" and the "Physical". In Feigl, H., Scriven, M. and Maxwell, G. (eds.) Concepts, Theories and the Mind-Body Problem, Minneapolis, Minnesota Studies in the Philosophy of Science, Vol. 2 , reprinted with a Postscript in Feigl 1967. 18. Flew A., (1983, ed), A Dictionary of Philosophy. London: Pan Books in association with The Macmillan Press. 19. Frolov I., (1984, ed), Dictionary of Philosophy. Moscow: Progress Publishers. 20. Gardiner H., (1985), The Mind′s New Science. New York: Basic Books. 21. Geulincx A., (1893), Metaphysica vera in Geulincx, Arnoldi Geulincx antverpiensis Opera philosophica, ed. J. P. N. Land, Vol. 2 , Hague: Martinum Nijhoff. 22. Heidegger M., (1927/1962), Being and Time (Sein und Zeit). Translated by J. Macquarrie and E. Robinson. New York: Harper and Row. 23. Hume D., (1739/1888), A Treatise of Human Nature. [ed. L Selby-Bigge]. Oxford: Oxford University Press. 24. Husserl E., (1913/1931), Ideas: General Introduction to Pure Phenomenology (Ideen au einer reinen Phänomenologie und phänomenologischen Philosophie). Translated by W. Boyce Gibson. New York: MacMillan. 25. Husserl E., (1929/1960), Cartesian Meditations: an Introduction to Phenomenology. Translated by Dorian Cairns. The Hague: M. Nijhoff. 26. Internet Encyclopedia of Philosophy, (2010), http://www.google.com/cse?cx=001101905209118093242%3Arsrjvdp2op4&ie=UTF-8&q=+Brain&sa=Search [Accessed on 26 Dec 2010]. 27. James W., (1890/1999), The Principles of Psychology. Ch 9. (2 vols.). New York: Henry Holt (Reprinted Bristol: Thoemmes Press, 1999). 28. Jackson F.C., (1982), Epiphenomenal Qualia, Philosophical Quarterly, 32, p127-136. 30. Köhler W., (1929), Gestalt Psychology. New York: Liveright. 31. Köffka K., (1935), Principles of Gestalt Psychology. New York: Harcourt Brace. 32. Lacey A.R., (1986), A Dictionary of Philosophy. London: Routledge and Kegan Paul. 33. Lashley K.S., (1923), The Behavioristic Interpretation of Consciousness, Psychol Review, 30 , p237-272. 34. Leibniz G.W., (1720/1925), The Monadology. Translated by R. Lotte. London: Oxford University Press. 35. Lewis C.I., (1929/1956), Mind and The World Order: an Outline of a Theory of Knowledge. New York: Charles Scribner′s Sons, reprinted in paperback by Dover Publications, Inc. New York, 1956. 36. Locke J., (1688/1959), An Essay on Human Understanding. New York: Dover. 37. Lycan W., (1987), Consciousness. Cambridge, MA: MIT Press. 38. Lycan W., (1996), Consciousness and Experience. Cambridge, MA: MIT Press. 39. Malebranche N., (1997), Dialogues on Metaphysics and on Religion, [ed. Jolley & trans. Scott.] Cambridge: Cambridge University Press. 40. Merleau-Ponty M., (1945/1962), Phenomenology of Perception (Phénoménologie de lye Perception). Translated by Colin Smith. London: Routledge and Kegan Paul. 41. Neisser U., (1965), Cognitive Psychology. Englewood Cliffs: Prentice Hall. 42. Penfield W.G., (1975), The Mystery of the Mind : A Critical Study of Consciousness and the Human Brain. Penfield, Wilder. Princeton University Press, 1975. 43. Penrose R., (1989), The Emperor′s New Mind: Computers, Minds and the Laws of Physics. Oxford: Oxford University Press. 44. Penrose R., (1994), Shadows of the Mind. Oxford: Oxford University Press. 45. Plato, (1952), Phaedo. Translated by R. Hackworth. Cambridge. 46. Russell B., (1914), Our Knowledge of the External World, Ch 3, 4. Chicago and London: The Open Court Publishing Company. 47. Russell B., (1918), Mysticism and Logic and Other Essays, Ch 7,8. London and New York: Longmans, Green. Repr. as A Free Man′s Worship and Other Essays, London: Unwin Paperbacks, 1976. 48. Russell B., (1921), The Analysis of Mind, London: George Allen and Unwin; New York: The Macmillan Company. 49. Ryle G., (1949/2000), The Concept of Mind, London: Hutchinson. Republished 2000, London: Penguin Books. 50. Shaffer J., (1972), Mind-Body Problem. In: Paul Edwards [Ed], The Encyclopedia of Philosophy, Vol 5 & 6 , p343. New York: Macmillan. 51. Skinner B. F., (1953), Science and Human Behavior. New York: MacMillan. 52. Smart J.J.C., (1959), ′Sensations and Brain Processes′, Philosophical Review, 68 , p141-156. 53. Smart J.J.C., (1963), ′Materialism′, Journal of Philosophy, 60 , p651-662. 54. Spinoza B., (1985), Ethics. In: Edwin Curley, translator, The Collected Writings of Spinoza (Princeton: Princeton University Press. Vol 1 ). 55. 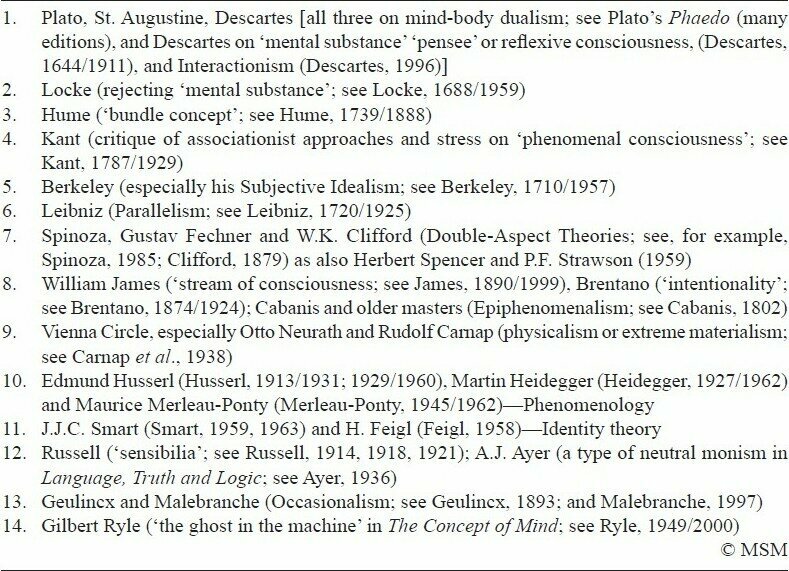 Stanford Encyclopedia of Philosophy, (2010), http://plato.stanford.edu/search/searcher.py?query=Brain [last retrieved on 2010 Dec 26]. 56. Strawson P.F., (1959), Individuals: an essay in descriptive metaphysics. London: Methuen. 57. Wundt W., (1897), Outlines of Psychology. Leipzig: W. Engleman. 58. Watson J., (1924), Behaviorism. New York: W. W. Norton. Kachewar, S.G. and Gandage, S.G.